MANILA, Philippines – The results of the September 2017 Special Professional Licensure Exam (SPLE) in Middle East for Nurses (NLE), together with the list of passers, top 10 examinees, performance of schools and related announcements areavailable at this website as PRC officially released the results online few working weeks after the last day of board examination. As announced, 623 out of 1,572 examinees passed the exams. The September 2017 SPLE for Nurses in Middle East was administered by PRC Board of Nursing headed by its Chairman, Glenda S. Arquiza (on leave); Gloria B. Arcos (Officer-In-Charge), and its members, Carmelita C. Divinagracia, Carfredda P. Dumlao, Florence C. Cawaon and Cora A. Anonuevo on September 1-3, 2017 at PRC testing locations in Al-Khobar, KSA; Jeddah, KSA; Riyadh, KSA; Doha, Qatar; Abu-Dhabi, United Arab Emirates; Al Ahmadi, Kuwait; Muscat, Oman; and Tel Aviv, Israel. Aside from the itemized results posted above, These important registration schedule and requirements shall be secured by a successful examinee. Meanwhile, below are the detailed program, coverage of exams and other info about September 2017 SPLE for Nurses in Middle East, courtesy of PRC. 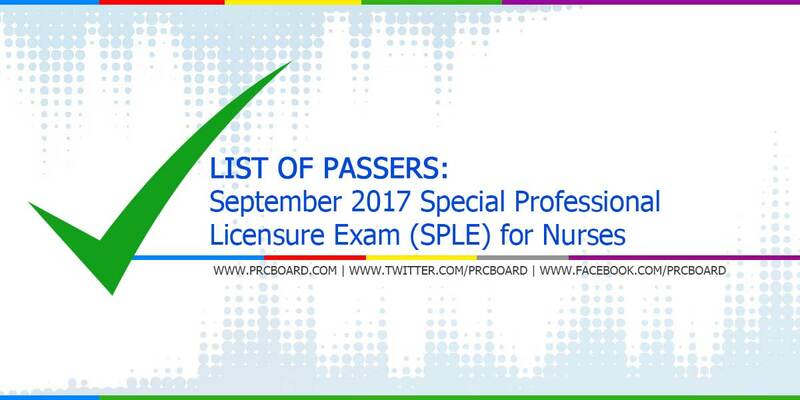 To receive up-to-date news about September 2017 SPLE for Nurses results, we advise our visitors to bookmark this page, visit PRC official website or follow us at our social media pages via Facebook and Twitter. Wla pdin po results.. oct. 18 npo ngaun.. mag2months na..
ung ibang nagtake ng oct may results na.. kmi september pa hanggang ngaun wla padin.. The result for middle east takers is very important.Their next move is based on this results.dont let them wait for a long time. Agree aq dyan.. ndi kmi makausad dahil sa results na yan.. wag nyo po kmi pag antayin ng matagal.. ndi na makatarungan..
God is watching,, remember patience is a virtue. Darating ang tamang panahon. Its worth the wait naman if paglabas ng result we are on the list of passers. Kaya Keep praying, Faith and Trust him. Lahat ng minamadali ay nababali. Try to wait 🙏. Patience is a virtue... its better to wait a victory than to get nothing in a hurry.. Keep praying and Faith in God..Sa tamang panahon results will come out.